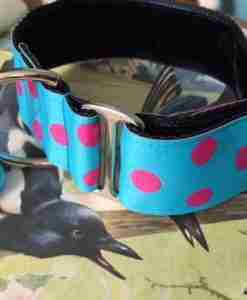 Some rather lovely greyhound collars, which are also great for salukis and lurchers. I’ve sourced some great polka dots in punchy colours, along with more contemporary fabrics, which will look very stately on your handsome greyhound. 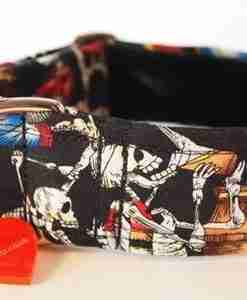 All of my dog collars and greyhound collars are very, very firmly sewn and guaranteed not to unravel at an inopportune moment! 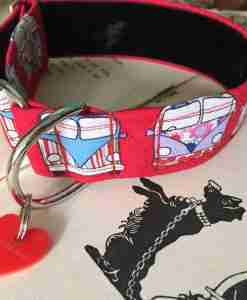 Please note that this collar is only suitable for greyhound style dogs as it’s 38mm wide (1 1/2″ in old money!) and is designed to slip over their slim (and very handsome) heads and then be adjusted to fit. 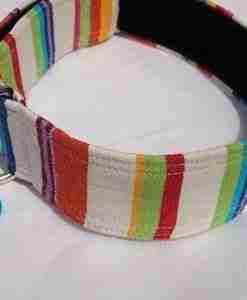 It does not therefore have an open/close clip, but a traditional greyhound martingale style adjuster. 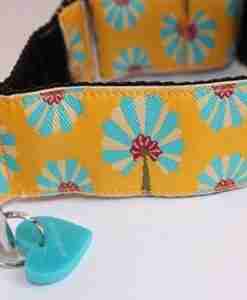 Your Scrufts’ greyhound collar is made utilising a strong polypropylene webbing, Swiss velvet and strong metal sliding adjusters and dee rings. 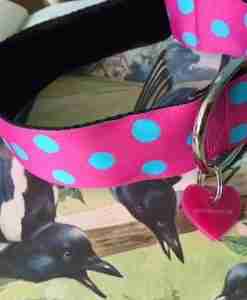 Handmade for your greyhound in my sunny Brighton studio.